Today, most modern smartphones come equipped with dual cameras, allowing users to unleash their photography potential without splurging a ton on an expensive DSLR. That said, if you feel like two lenses are not quite cutting it, then you can even opt for phones like the Huawei P20 Pro (review), the LG V40 or the recently-launched Galaxy A7 (2018) (first impressions), all of which offer three shooters at the back. Not satisfied with that? Do you want more? Well, I suppose you’ll feel right at home with Samsung‘s latest offering, the Galaxy A9, which is the world’s first smartphone to come with four rear-facing cameras. 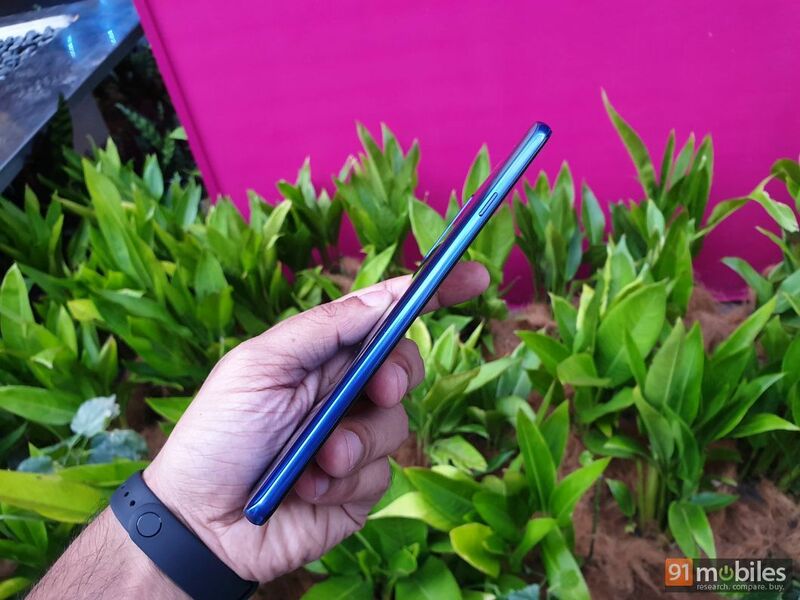 The device was unveiled at an event held today on Malaysia, and I managed to get up, close and personal with it to bring you my first impressions. Samsung has really upped the ante when it comes to the design of its A series of Galaxy smartphones. Much like the Galaxy A7, the A9 employs a glass-sandwich design which is held together by a sleek metal trim. Samsung has cut corners (quite literally) on the metal trim and has chamfered the edges of the device, ensuring buyers don’t feel fatigued whilst holding the phone over long hours. What’s more, despite shipping with a plethora of nifty tech, the Samsung Galaxy A9 Pro doesn’t feel too chunky or heavy in the hand. I would also like to commend the Chaebol on the excellent weight distribution of the handset, which quite honestly is a feat when you factor in the quad-camera setup which has been positioned towards the top left of the device at the rear. 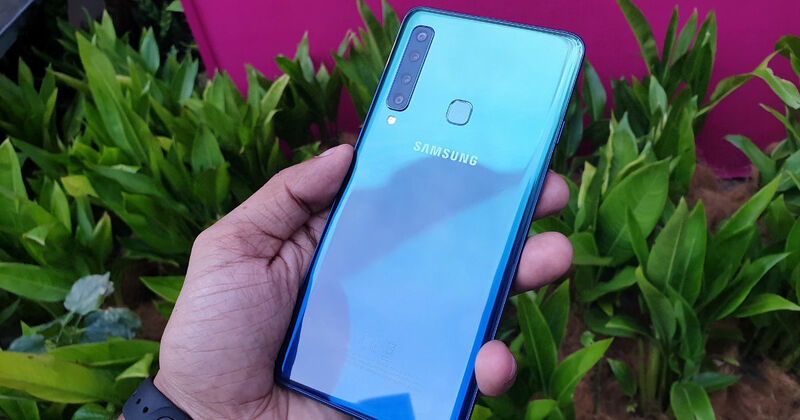 As good as the Samsung Galaxy A9 looks from afar, it still is a glass-back smartphone and therefore, you’ll have to wipe it every now and then to keep it nice and shiny. I’d also like to point out that the smartphone is quite slippery and thanks to its ginormous display, isn’t quite usable with just one hand. 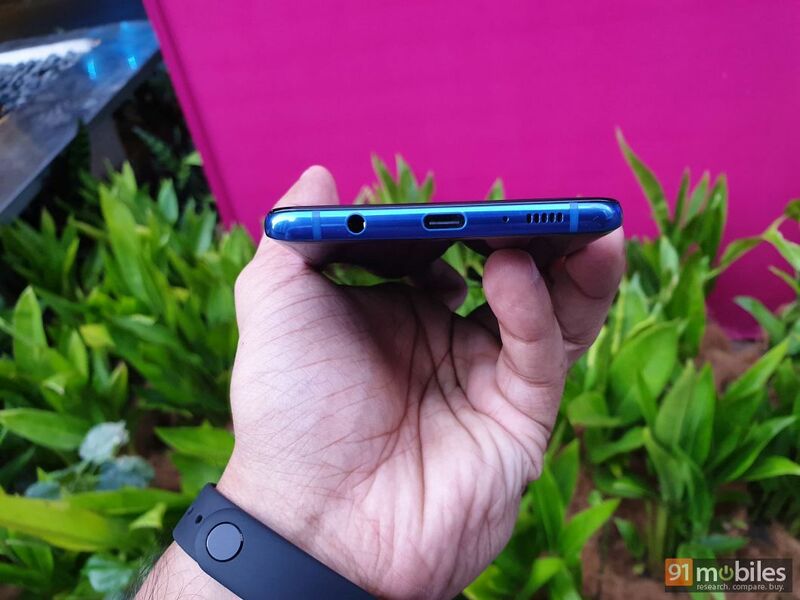 For ports and buttons, you’ll find the power key and the volume rocker on the right-hand side of the Galaxy A9, while the left spine is home to the Bixby button. The top of the device is the home to a dual-SIM tray and a microphone, with the speaker grill, the USB Type-C port and the 3.5mm audio socket positioned towards the bottom. 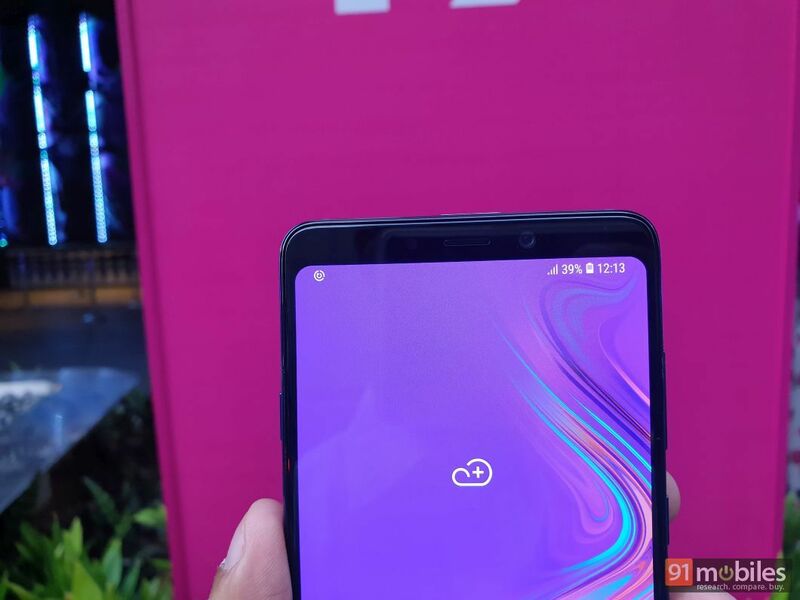 There’s a fingerprint sensor located towards the rear of the smartphone however, I couldn’t test its accuracy during my limited time with the handset on the show floor. You’ll also be able to unlock the smartphone by means of facial recognition. 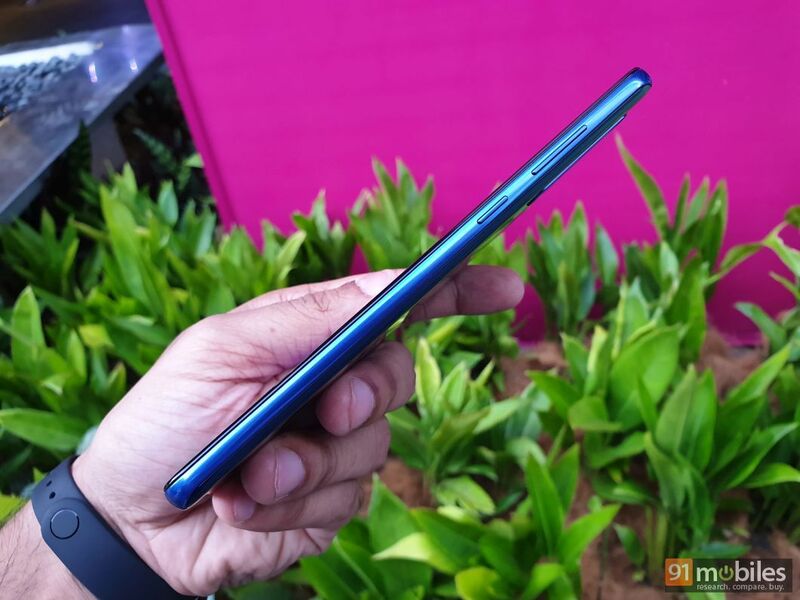 The Samsung Galaxy A9 ships with a 6.3-inch FHD+ Super AMOLED display and much like most smartphones launched this year, the A9 Pro too ships with sleek bezels, giving the device a tall, 18:9 aspect ratio. Now, if this isn’t your first rodeo with Samsung’s Super AMOLED display, then you already know what to expect here. For the uninitiated, the A9’s panel offers excellent viewing angles, deep dark blacks, vibrant colours and satisfactory peak brightness levels. I did notice a slight colour shift when tilting the smartphone from the bottom, however, I doubt it’ll be a deal-breaker for anyone. In terms of performance, the Galaxy A9 ships with an octa-core processor which works alongside either 6GB or 8GB of RAM. Both variants come with 128GB of in-built storage, which can be further expanded on both the variants by means of a microSD card. While I couldn’t jump into Pochinki at the event to test the phone’s gaming performance, I can confidently say that the device should be able to handle heavy tasks and gaming well. The UI animations on the handset felt swift, apps opened quickly and I could switch between different apps in a jiffy too. Now, it’s time to address the elephant in the room – the quad-camera setup which sits at the back of the Galaxy A9 Pro. Well, from top to bottom, you’ll get an 8MP f/2.4 wide-angle lens with a 120-degree field of view, a 10MP f/2.4 telephoto lens with 2x optical zoom capabilities, a standard 24MP f/1.7 lens and a 5MP f/2.2 depth-sensing shooter which supports the company’s live focus technology. Lest I forget, the smartphone also comes with a 24-megapixel selfie camera, which takes the tally up to five cameras on the smartphone. Take that, LG. While I don’t have sample shots from the smartphone’s cameras yet, I can tell you that the device focuses on subjects quickly and doesn’t take a long time to switch from say, the telephoto lens to the standard lens. The quality of the photos I clicked during my brief session seemed promising, however, I will have to spend some more time with the device to pass any comment on the A9 Pro’s camera capabilities. Lastly, the Samsung Galaxy A9 Pro ships with a massive 3,800mAh battery which should comfortably see you through the end of a busy day. The handset runs the brand’s Experience UX v9.0 with a skin of Android Oreo v8.1. Sadly, the brand hasn’t confirmed when can we expect the Android Pie update on the device. If you’re interested in picking up the smartphone, then Samsung has three colours for you to choose from – pink, blue and black. The brand has confirmed that the Galaxy A9 will be launched in India next month. While we don’t know the pricing yet, it’s evident that the Korean company is aiming to make a mark with its latest offering. We’re surely keen to test out its imaging prowess and whether or not the Samsung Galaxy A9 Pro is a good buy or not, so stay tuned for that.